Author of many comedies in which he usually starred himself. He was the son of the merchant Bernhard Götz, who died when he was two years old. Together with his mother Selma Rocco he moved to Halle an der Saale. Goetz took acting lessons with Emanual Reicher and in 1907 he obtained an engagement the Stadttheater in Rostock. From 1909 until 1911 he performed at the Intimen Theater in Nürnberg and then in Berlin at the Kleinen Theater, the Lessingtheater and the Deutschen Theater. In 1912 he had married actress Erna Nitter, with whom he appeared in silent movies. In 1917 he divorced her and in 1923 he married another actress, Valerie von Martens. Togheter they became very famous and they stayed together until his death. In 1930 his comedy "Hokuspokus" was filmed with Lilian Harvey und Willy Fritsch and in 1938 he directed his first movie, "Napoleon ist an allem schuld". The main parts were played by himself and his wife. There were hidden jokes against the nazi's in the movie, but still it was a succes. In 1939 they moved to the USA. There he wrote scripts, among them "Two Faced Woman", filmed with Greta Garbo. In 1946 they returned to Switzerland. There they enjoyed an instant succes with "Das Haus in Montevideo" and they soon returned to the German stages. In 1951 he turned "Das Haus" into a movie. In 1958 he became a member of the German Academy of Arts. He retired to Liechenstein and died in Switzerland in 1960. 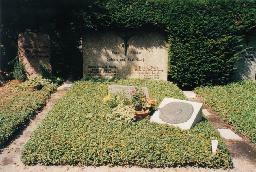 The grave of Curt Goetz and Valerie Martens at the Friedhof Heerstrasse, Berlin.